電圧 最小放電電圧= 7000279999999999999♠2.8 V. 作動電圧= 7000300000000000000♠3.0–3.3 V. 最大充電電圧= 7000360000000000000♠3.6 V.
^ Nagaura, T.; Tozawa, K. (1990). 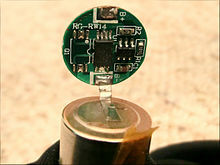 “Lithium ion rechargeable battery”. Progress in Batteries & Solar Cells 9: 209–217. ISSN 0198-7259. ^ Whittingham, M. S. (1976). “Electrical Energy Storage and Intercalation Chemistry”. Science 192 (4244): 1126–1127. doi:10.1126/science.192.4244.1126. http://www.sciencemag.org/content/192/4244/1126.abstract. ^ Besenhard, J.O. ; Fritz, H.P. (1974). “Cathodic reduction of graphite in organic solutions of alkali and NR4+ salts”. Journal of Electroanalytical Chemistry and Interfacial Electrochemistry 53 (2): 329–333. doi:10.1016/S0022-0728(74)80146-4. ISSN 0022-0728. http://www.sciencedirect.com/science/article/pii/S0022072874801464. ^ Besenhard, J.O. (1976). “The electrochemical preparation and properties of ionic alkali metal-and NR4-graphite intercalation compounds in organic electrolytes”. Carbon 14 (2): 111–115. doi:10.1016/0008-6223(76)90119-6. ISSN 0008-6223. http://www.sciencedirect.com/science/article/pii/0008622376901196. ^ Schöllhorn, R.; Kuhlmann, R.; Besenhard, J.O. (1976). “Topotactic redox reactions and ion exchange of layered MoO3 bronzes”. Materials Research Bulletin 11 (1): 83–90. doi:10.1016/0025-5408(76)90218-X. ISSN 0025-5408. http://www.sciencedirect.com/science/article/pii/002554087690218X. ^ Besenhard, J.O. ; Schöllhorn, R. (1976–1977). “The discharge reaction mechanism of the MoO3 electrode in organic electrolytes”. Journal of Power Sources 1 (3): 267–276. doi:10.1016/0378-7753(76)81004-X. ISSN 0378-7753. http://www.sciencedirect.com/science/article/pii/037877537681004X. ^ Besenhard, J.O. ; Eichinger, G. (1976). “High energy density lithium cells: Part I. Electrolytes and anodes”. Journal of Electroanalytical Chemistry and Interfacial Electrochemistry 68 (1): 1–18. doi:10.1016/S0022-0728(76)80298-7. ISSN 0022-0728. http://www.sciencedirect.com/science/article/pii/S0022072876802987. ^ Eichinger, G.; Besenhard, J.O. (1976). 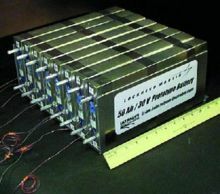 “High energy density lithium cells”. Journal of Electroanalytical Chemistry and Interfacial Electrochemistry 72 (1): 1–31. doi:10.1016/S0022-0728(76)80072-1. ISSN 0022-0728. http://www.sciencedirect.com/science/article/pii/S0022072876800721. ^ Zanini, M.; Basu, S.; Fischer, J. E. (1978). “Alternate synthesis and reflectivity spectrum of stage 1 lithium—graphite intercalation compound”. Carbon 16 (3): 211. doi:10.1016/0008-6223(78)90026-X. http://www.sciencedirect.com/science/article/pii/000862237890026X. ^ Basu, S.; Zeller, C.; Flanders, P. J.; Fuerst, C. D.; Johnson, W. D.; Fischer, J. E. (1979). “Synthesis and properties of lithium-graphite intercalation compounds”. Materials Science and Engineering 38 (3): 275. doi:10.1016/0025-5416(79)90132-0. http://www.sciencedirect.com/science/article/pii/0025541679901320. ^ Dey, A.N. ; Sullivan, B.P. (1970). “The Electrochemical Decomposition of Propylene Carbonate on Graphite”. Journal of The Electrochemical Society 117 (2): 222-224. doi:10.1149/1.2407470. http://jes.ecsdl.org/content/117/2/222.abstract. ^ Mizushima, K.; Jones, P.C. ; Wiseman, P.J. ; Goodenough, J.B. (1980). “LixCoO2 (0<x<-1): A new cathode material for batteries of high energy density”. Materials Research Bulletin 15 (6): 783–789. doi:10.1016/0025-5408(80)90012-4. ISSN 0025-5408. http://www.sciencedirect.com/science/article/pii/0025540880900124. ^ Yazami, R.; Touzain, Ph. (1983). “A reversible graphite-lithium negative electrode for electrochemical generators”. Journal of Power Sources 9 (3): 365–371. doi:10.1016/0378-7753(83)87040-2. ISSN 0378-7753. http://www.sciencedirect.com/science/article/pii/0378775383870402. ^ T. Yamabe; K. Tanaka; K. Ohzeki; S. Yata. “Electronic structure of polyacenacene. A one-dimensional graphite”. Solid State Communications 44 (6): 823–825. doi:10.1016/0038-1098(82)90282-4. http://www.sciencedirect.com/science/article/pii/0038109882902824 2015年10月29日閲覧。. ^ Thackeray, M. M.; David, W. I. F.; Bruce, P. G.; Goodenough, J. B. (1983). “Lithium insertion into manganese spinels”. Materials Research Bulletin 18 (4): 461-472. doi:10.1016/0025-5408(83)90138-1. http://www.sciencedirect.com/science/article/pii/0025540883901381. ^ Fong, Rosamaría; Sacken, Ulrich von; Dahn, J.R. (1990). “Studies of Lithium Intercalation into Carbons Using Nonaqueous Electrochemical Cells”. Journal of The Electrochemical Society 137 (7): 2009-2013. doi:10.1149/1.2086855. http://jes.ecsdl.org/content/137/7/2009.abstract. ^ Padhi, A. K.; Nanjundaswamy, K. S.; Goodenough, J. B. (1997). “Phospho‐olivines as Positive‐Electrode Materials for Rechargeable Lithium Batteries”. Journal of The Electrochemical Society 144 (4): 1188–1194. doi:10.1149/1.1837571. http://jes.ecsdl.org/content/144/4/1188.abstract 2015年12月3日閲覧。. ^ (PDF) Gold Peak Industries Ltd., Lithium Ion technical handbook. http://www.gpbatteries.com/html/pdf/Li-ion_handbook.pdf. ^ H.C. Choi; et al. (2003). J. Phys. Chem. B 107: 5806. doi:10.1021/jp030438w. ^ G.G. Amatucci; J.M. Tarascon; L.C. Kein (1996). J. Electrochemical Society 143: 1114. doi:10.1149/1.1836594. ^ 藤井英敏(2009年8月18日)リチウムイオン電池の価格を下げる「脱コバルト」レースの勝者は？ Archived 2009年8月21日, at the Wayback Machine. ^ “安全性に優れた新型二次電池SCiB”. 東芝レビュー 63 (2): 54. (2008). http://www.toshiba.co.jp/tech/review/2008/02/63_02pdf/f03.pdf 2015年10月29日閲覧。. ^ R. Ruffo; S. S. Hong, C. K. Chan, R. A. Huggins, Y. Cui (2009). “Impedance Analysis of Silicon Nanowire Lithium Ion Battery Anodes”. J. Phys. Chem. C. (113 (26), (2009)): 11390-11398. doi:10.1021/jp901594g. http://www.stanford.edu/group/cui_group/papers/Impedance_jpc.pdf 2009年9月1日閲覧。. ^ C. K. Chan; X. F. Zhang, Y. Cui (2007). “High Capacity Li-ion Battery Anodes Using Ge Nanowires”. Nano Lett. (8 (2007)): 307-309. doi:10.1021/nl0727157. http://www.stanford.edu/group/cui_group/papers/High%20Capacity%20Li-ion%20Battery%20Anodes%20Using%20Ge%20Nanowires.pdf. ^ Lithium Ion Batteries: Solid Electrolyte Interphase. London: Imperial College Press. (2004). ^ Yang, Chongyin, et al. "4.0 V aqueous Li-ion batteries." Joule 1.1 (2017): 122-132. ^ Sun, Wei, et al. "“Water-in-Salt” electrolyte enabled LiMn2O4/TiS2 Lithium-ion batteries." Electrochemistry Communications 82 (2017): 71-74. ^ Guangyuan Zheng; Yuan Yang; Judy J. Cha; Seung Sae Hong; Yi Cui (2011). “Hollow Carbon Nanofiber-Encapsulated Sulfur Cathodes for High Specific Capacity Rechargeable Lithium Batteries”. Nano Lett. 11: 4462-4467. doi:10.1021/nl2027684. ^ He, Guang, et al. "Tailoring porosity in carbon nanospheres for lithium–sulfur battery cathodes." Acs Nano 7.12 (2013): 10920-10930. ^ Zheng, Guangyuan, et al. "Interconnected hollow carbon nanospheres for stable lithium metal anodes." Nature nanotechnology 9.8 (2014): 618. ^ Guo, Yu-Guo; Hu, Jin-Song; Wan, Li-Jun (2008). “Nanostructured Materials for Electrochemical Energy Conversion and Storage Devices”. Adv. Mater. 20: 2878-2887. doi:10.1002/adma.200800627.